If you had to choose just one area to visit in Thailand, which would you choose? My answer to that question was Phuket. And it just so happens that millions of other travelers make that same exact choice every year. Why? Well, that’s not a tough question to answer. Pristine beaches, exotic wildlife, delicious cuisine, lush jungles, and crazy nightlife are among the many reasons why Phuket is one of Thailand’s top two destinations. Phuket has it all. And as such, how will you spend your valuable time there? In this guide to Phuket, Thailand, you’ll find recommendations on what to do, what to skip, and where to stay, to make the best of your island vacation! If you visit the Tiger Kingdom in Phuket, you’ll spend about $50 USD to perpetuate and support the disgusting animal abuse that’s committed against Thailand’s tigers, all day, every day. If you support the (likely) sedation of tigers, having them locked up in tiny cages, and released only to be poked and prodded by bamboo sticks, forcing them to pose properly for photos with humans, then by all means, visit this place. Does that sound like the life a tiger deserves? I don’t think so. I couldn’t convince my friend not to visit here, so I angrily waited in the car for her. Afterward, she told me that she wished she hadn’t done it, because it was an awful sight to see, and she felt like a fool for wasting her money on something so vile. And for what? For “cool” Instagram posts. If you want to see tigers, go see them in the wild, on a safari, in India. The only thing as appalling as Tiger Kingdom would be the companies that exploit the health and lives of elephants to make money. I don’t care what these companies’ websites say about how they treat their elephants well and ethically; it’s simply a lie. If these animals were treated right, they’d be living in protected sanctuaries and national parks, not carrying a wooden bench and five people on their backs for twelve hours a day. If you would like to interact with elephants in Thailand, visit the Elephant Nature Park, in Chiang Mai, where elephants roam free. There, elephants are protected from abuse and treated with the utmost love and care. On top of being an incredibly tacky and overpriced show, elephants are trained to do tricks, stand on their back legs, and are subject to the loud explosions and bright flashes of fireworks. Need I say more? Visiting the islands off of Phuket’s coast will allow you to experience the Thailand you’ve always imagined. Do yourself a favor and book a couple of tours with Simba Sea Trips during your time in Phuket. With Simba, we visited islands like Koh Yao Noi, James Bond Island, and the Phi Phi islands, we snorkeled, we kayaked, we spelunked, we interacted with monkeys, and we ate delicious Thai food. The days we spent with Simba were the highlight of our Thailand trip, and they were worth every penny. This company is the absolute best in Phuket; but if you need a second opinion, just read these reviews. 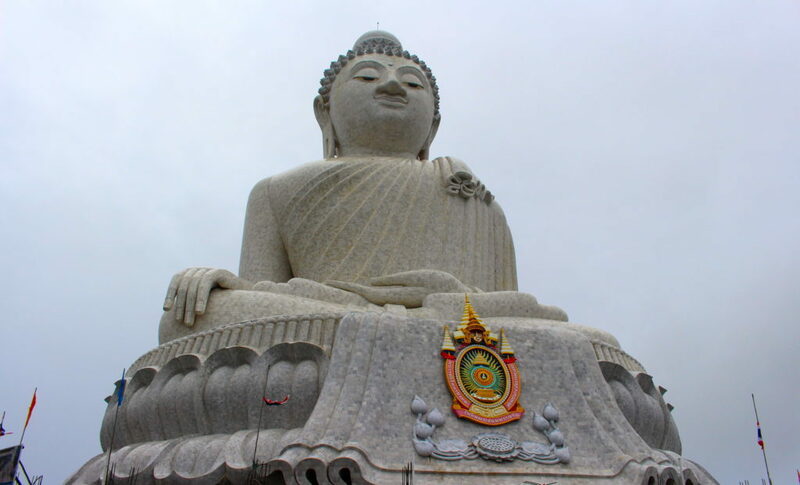 Hire a driver and summit Mount Nagakerd to see Big Buddha – all 135 tons of him. At the top, you’ll find peace, a cultural experience, and 360 degree views of southern Phuket. As an added bonus, Big Buddha is free to visit. About 20 minutes from Big Buddha, you’ll find Wat Chalong, one of the largest and most important Buddhist temples in Phuket. Visit Wat Chalong to pay your respects, watch Thai Buddhists pray, and learn a bit about Buddhism. 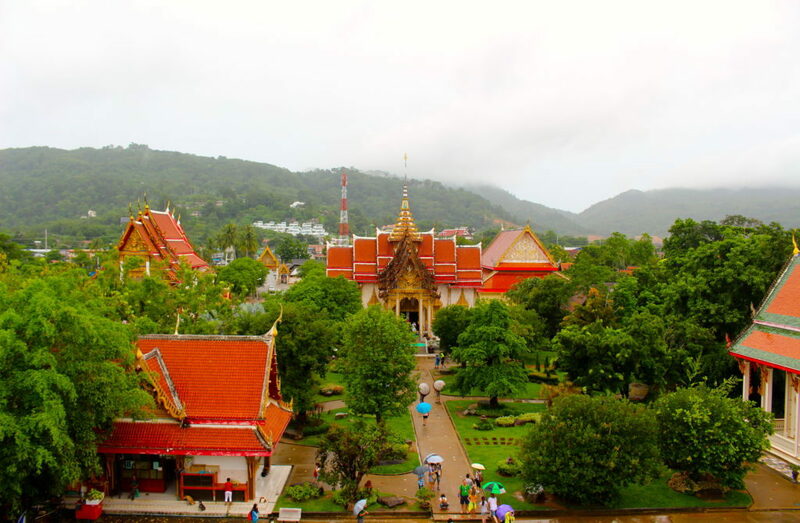 Visiting Wat Chalong is an activity that will interest any traveler, and on top of that, it’s absolutely beautiful. Entry is also free. 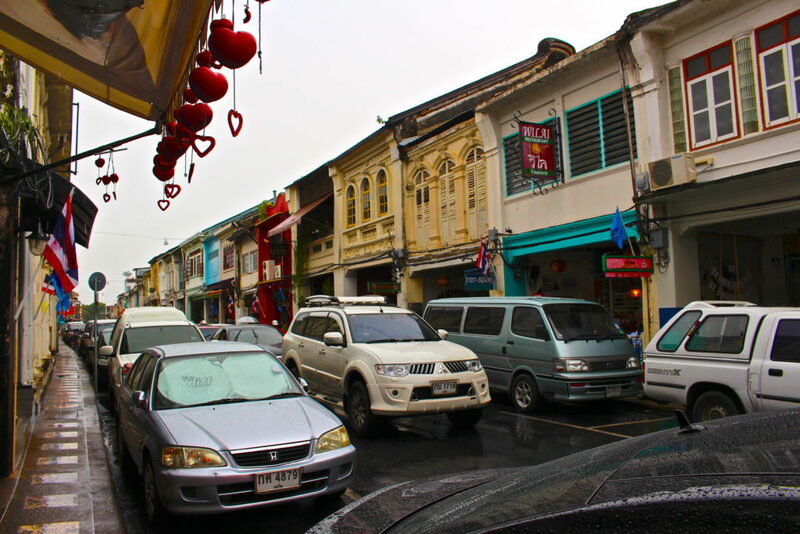 For colorful colonial buildings, great restaurants, old shophouses, temples, and museums, Phuket Old Town is the place to be! Make sure to visit Old Town on a weekend to experience the thrill and chaos of a Thai night market! You won’t find better street food anywhere else on the island! If you’re in need of a good work out, why not give Muay Thai a try? I’ve probably never worked out harder in my life, but learning the art of Thai boxing couldn’t have been more fun! I was just a little sore the next day… Okay, I was a lot sore! Elephants, beautiful beaches, and spicy foods are Thailand’s claim to fame. Oh yeah, and ladyboys. If you want to experience the wonder of Thai ladyboys – beautiful, voluptuous, inconspicuous ladyboys – attend a ladyboy cabaret. You will never see more beautiful women in your life, but there’s just one catch: they’re not actually women! You can buy tickets to a ladyboy show here. 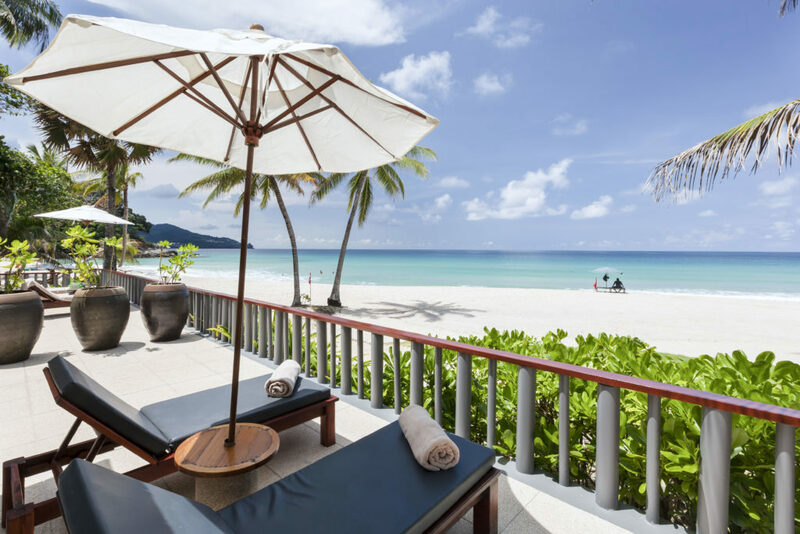 Located on the west coast of Phuket, homes of the 5-star resorts listed below, Kamala and Surin are two beaches that you should not miss during your trip to Phuket! 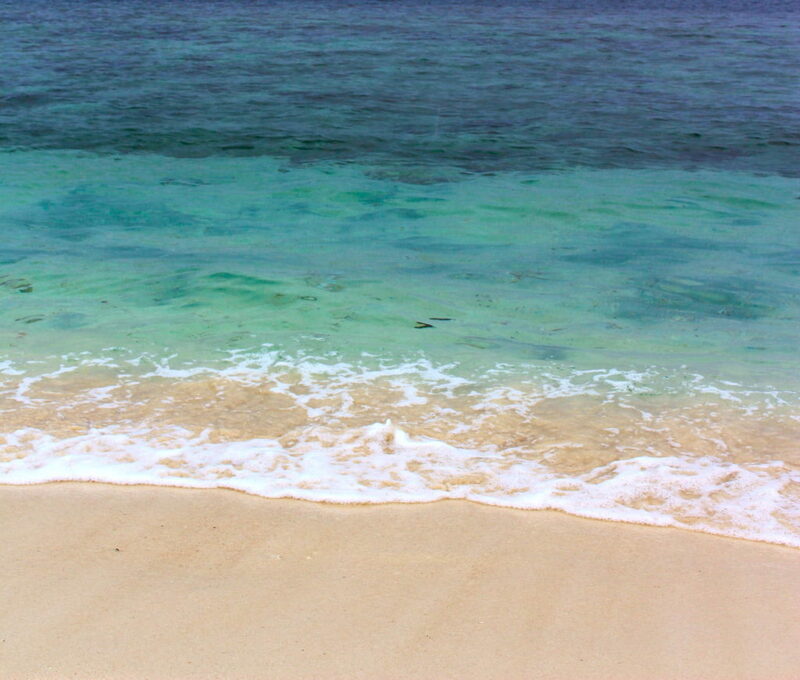 White, soft sand, turquoise water, and peaceful relaxation await you at these beaches. Don’t forget your sunscreen! Trashy? Check. Chaotic? Check. Entertaining? Check. 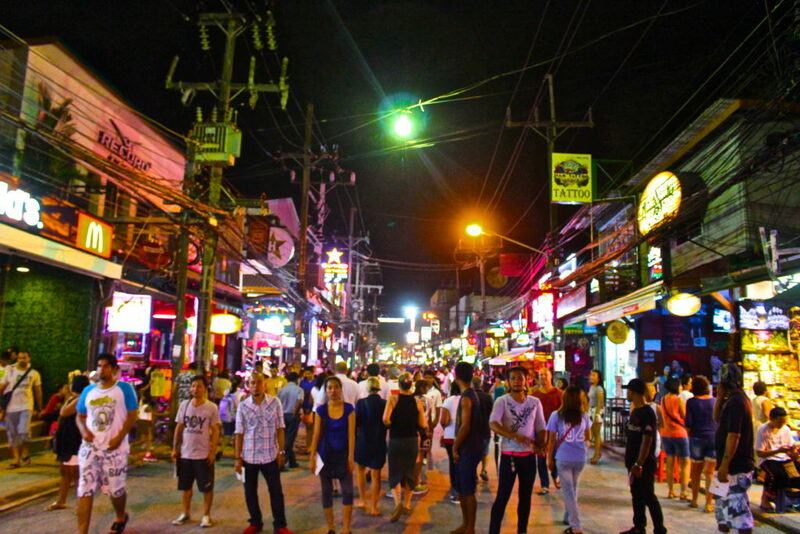 You should go to Patong at least once during your time in Phuket for a fun night out. Think of NOLA’s Bourbon Street, but a rowdier, more exciting, more Thai version, and that’s what you’ll find at Patong! Thai food is one of the most flavorful cuisines on the planet. Don’t even try debate me on that. If you want to do Phuket right, lose the diet and eat, eat, eat anything and everything you can. The following 5-star hotels in Phuket are all equally luxurious and service-oriented, so you really can’t go wrong here! Hyatt Regency Phuket: Here, you’ll find incredible ocean views, plush rooms, delicious food, and great service. Read about our stay at the Hyatt Regency Phuket here. The Surin Phuket: This resort’s stylish cottages, beautiful beach, and giant pool will be all you need during your trip to Phuket! Read about our stay at The Surin Phuket here! Twinpalms Phuket: Incredibly chic and luxurious, this hotel will satisfy all of your 5-star cravings! Read about our stay at the Twinpalms Phuket here! Taxis and tuk-tuks will be the easiest ways to get around Phuket. You can easily hire a driver for an entire day of sightseeing, and it will run you about $10 USD per hour. Not bad! FIND OTHER GREAT DEALS ON PHUKET ACCOMMODATION HERE! Over to you! Have you ever thought about visiting Phuket? 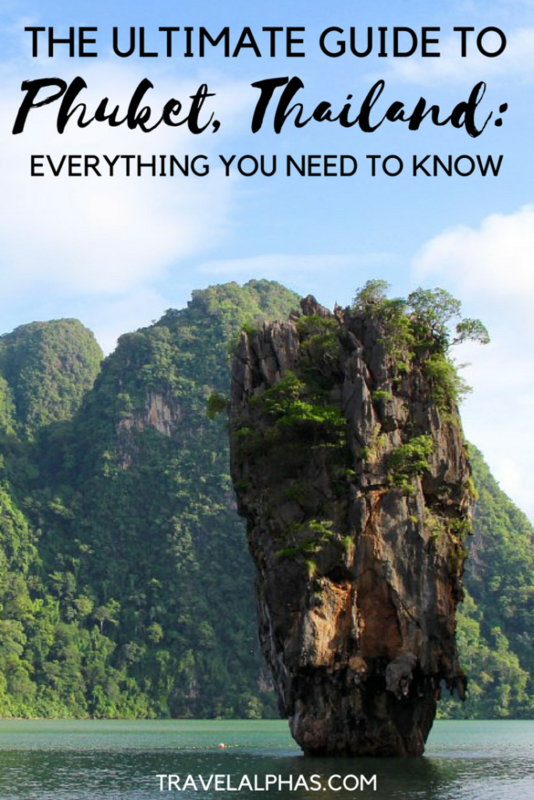 Did you find this guide to Phuket, Thailand helpful? If you’ve been to Phuket, what was the best experience you had while there? That’s our guide to Phuket, Thailand! The Travel Alphas were welcomed as guests of Hyatt Regency Phuket, The Surin Phuket, and Twinpalms Phuket, but as always, all opinions are entirely our own. We just happened to love every single one of those 5-star hotels! How could we not?! Also, this post contains affiliate links. Oh that looks/sounds absolutely fantastic! I’ve been wanting to go to Phuket ever since I realized it exists! It really is a wonderful place! I cannot wait to return someday! Thanks for stopping by! This is such a great article especially because you mentioned the things you shouldn’t do, aka support the terrible animal industry there! Also, yes I’d eat everything in sight for sure. I just had to use Google translate to understand your comment, because sadly, I don’t speak German!! But anyway, I’m glad you liked the post. Thanks for stopping by! It’s a shame that they choose to mistreat their animals for profit. Thanks for shedding light on this bad practice in Thailand. I haven’t been to Thailand before, but your photos are so inviting — the beach looks amazing! I feel like it’s my duty to help get the word out there! Other than the animal exploitation, Phuket is AMAZING. I loved riding around in tuk-tuks in Cambodia! They were crazy, but so fun. And daaaang, you’ve got some serious muscles in that boxing photo haha. On a serious note, I’m glad you mentioned the treatment of the animals in the various tourist activities. It’s so important to get that type of information out, and I appreciate your honest input. But anyways, yeah, I just felt like I should say something! Thank you for saying NOT to do the Tiger Kingdom and riding elephants! It really disgusts me that I still see so many travel bloggers doing both these things and posting in all over instagram! They are both so cruel. A lot of people have riding elephants as one of their dream things to do- but it is so cruel what happens to them in order to be “broken in”. They are wild animals- they don’t let people ride them for fun. Agh! Anyway, I have not been to that side of Thailand- I would LOVE to go sometime! I completely agree with you. I just cannot understand how some people actually have “Ride an elephant in Thailand” on their bucket lists, yet thousands and thousands do. It makes no sense to me. I’m sure you’d love Phuket, though, other than the animal tourism industry! Thanks for stopping by! Well done for saying don’t go to Tiger Temple or on an elephant trek, these poor animals really suffer! They really do. It’s so sad! I felt the need to say something about it.